I love, love, love doughnuts. And when I discovered a great online vegan donut recipe a few years ago, I was just thrilled. But this entry isn't about baking recipes (although I'd like to post some of those later). 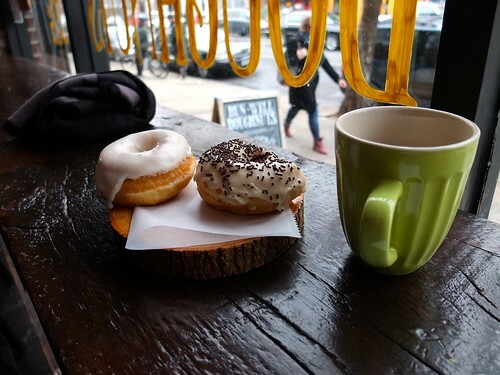 It's about a great little cafe that's popped up in Brooklyn, called Dun-Well Doughnuts. When I read about this online I couldn't believe it! It sounded like a dream come true. 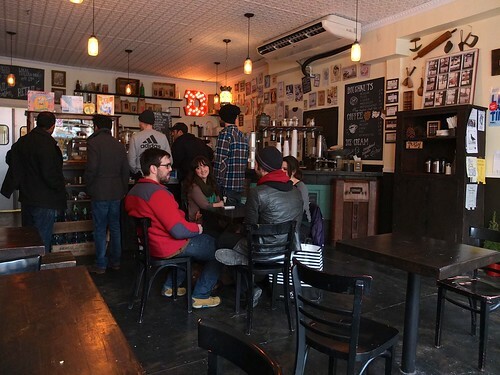 They boast over 200 flavors of doughnuts (such as peanut butter and jelly, french toast, Boston cream, root beer, smores, blood orange, and strawberry kiwi). 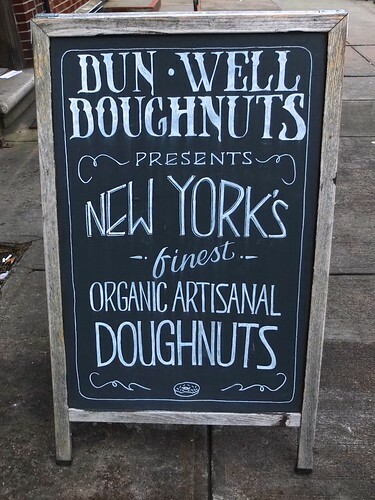 And they were voted Best Doughnut in New York in 2012! Aside from the doughnuts, the coffee's really good (according to my boyfriend, and other online reviews). And for the non-coffee drinkers out there, they also have Italian soda, and egg creams! I got a chocolate one (below). SO good. Did I mention everything they sell is vegan? They had donut kabobs on Sunday, although by the time I got my camera out I'd already eaten one and a half of them. Aside from some of the more outrageous flavors, they've also got your standard, classic favorites. The chocolate doughnut (above) was mouthwateringly delicious. I took this photo (above) when several parties had just cleared out--otherwise the place was packed the whole time we were there! The ambience was quite nice, too. Lots of little vintage touches, all very tastefully done. They serve the doughnuts on lacquered wood slabs. 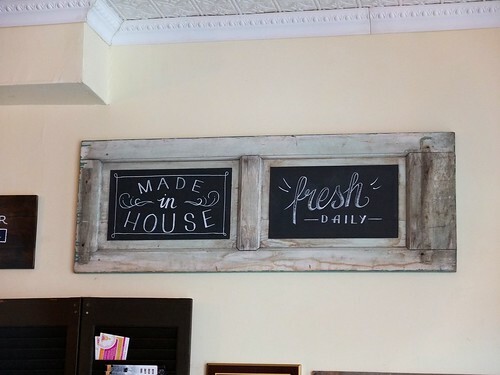 They only have select flavors on a given day, and they bake them fresh twice daily. We got there around noon on a Sunday, and aside from a jelly doughnut, the flavors we tried (described and pictured above) were all that they had available. I heard they were almost done with a new batch, but it's a shame we missed out on some more variety. I guess I might have to go back! I thought the doughnuts were a-maz-ing...I haven't stopped thinking about them. My boyfriend thought they were really good--but I'm not sure he would make a regular trip from Manhattan for them. 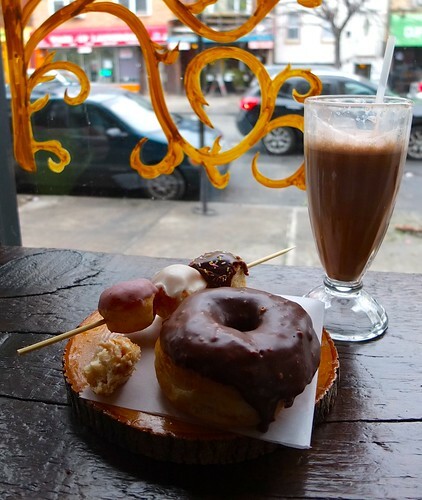 If you're a real doughnut aficionado, though, it's absolutely worth the trek!